Networking hardware is far, far more than the sum of its parts. 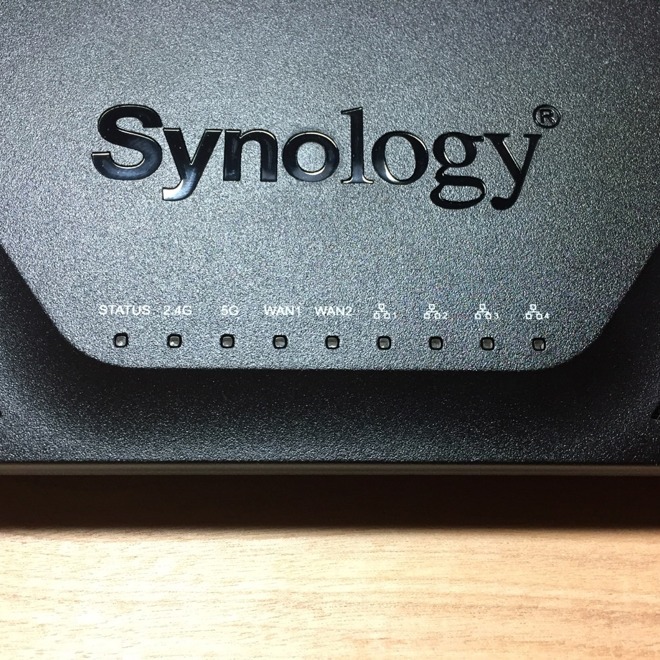 For instance, on the box, the Synology RT2600AC looks like nearly every other router. It's got four Gigabit Ethernet ports in addition to the WAN port. It provides 2.4GHz and 5GHz networks with 802.11ac speeds of up to 800Mbps and 1.73Gbps respectively, it has a few USB ports for storage and peripheral sharing. And, as a nicety, it has a SD card reader -- but more on all that in a bit. 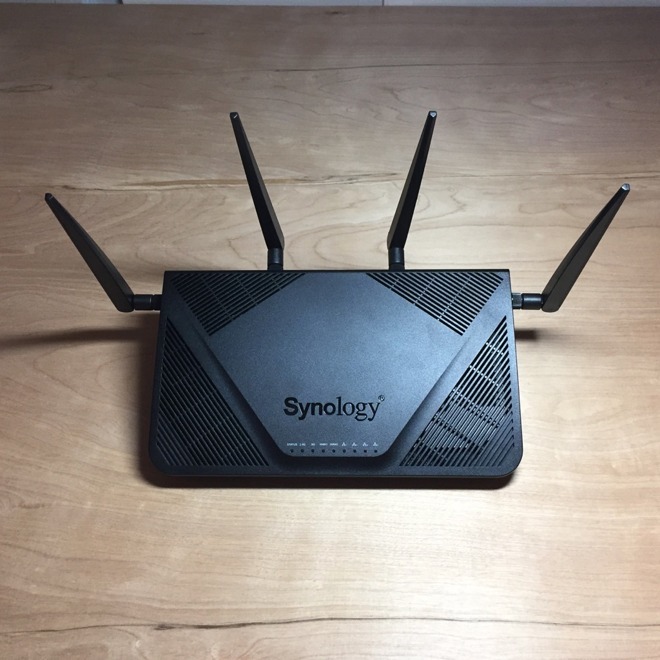 But, we're just going to stay this straight away -- the $199 Synology RT2600ac router delivers strong Wi-Fi rivaling mesh systems we've installed. The 4x4 MIMO antenna and the router hardware is able to combine the 2.4GHz and 5GHz radios under the same network name and let devices join the radio that delivers the best signal. Almost every esoteric option you could wish for in regards to network settings is available -- and this turns out to be great, instead of just being a confusing jumble of features. 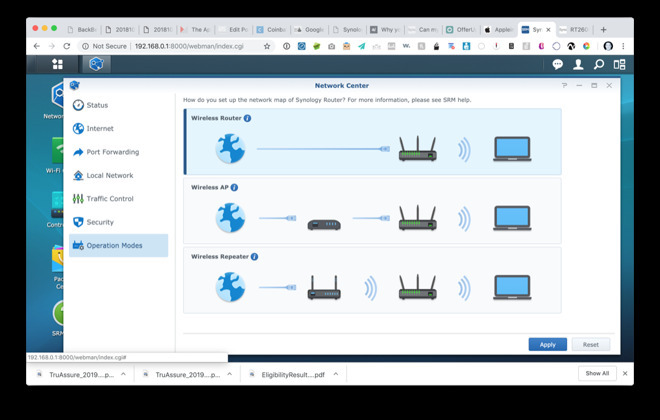 Many recent routers attempt to make things easy by providing setup wizards, basic and advanced modes, or they strip out features, or make setup possible from a mobile phone app only -- and Synology hasn't gone that way. Synology's RT2600ac does work with the company's DS Router mobile app which makes initial setup easy. 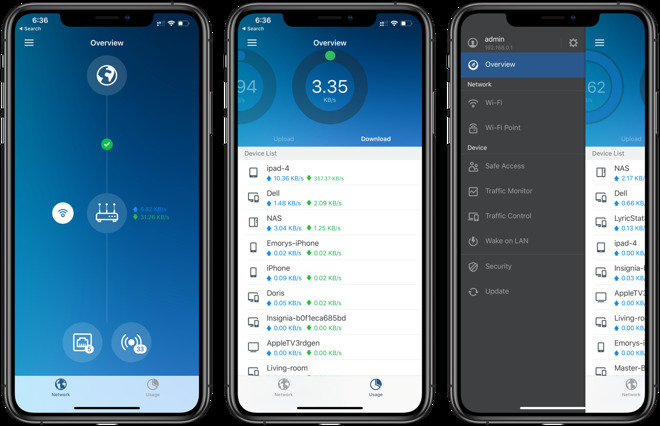 After setup, this app is more for monitoring connections and making a few small configuration changes, or scheduling hours when devices can have access to the Internet. 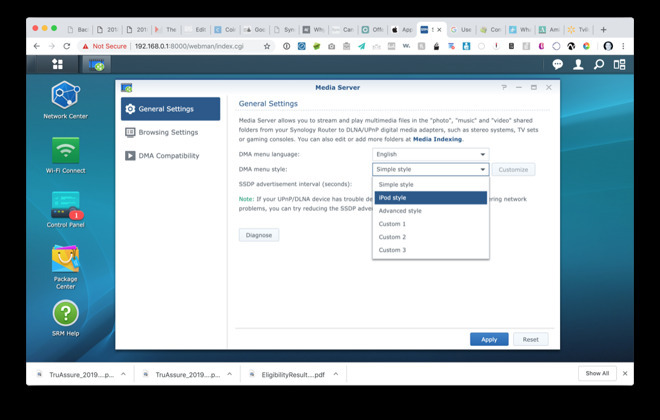 The greater flexibility in configuration is done via the browser -- a welcome return to "standards." 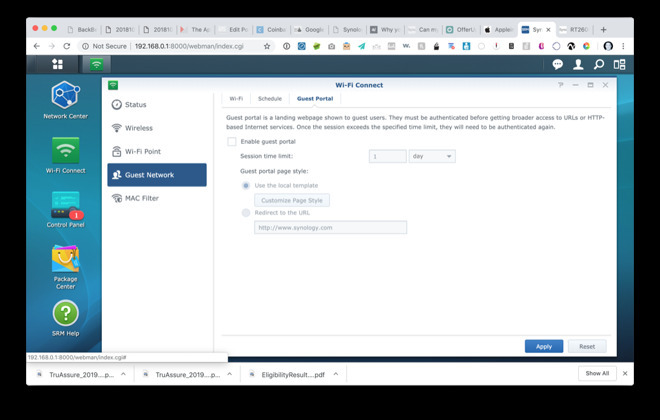 Network configuration is done in the sensibly named "Network Center." 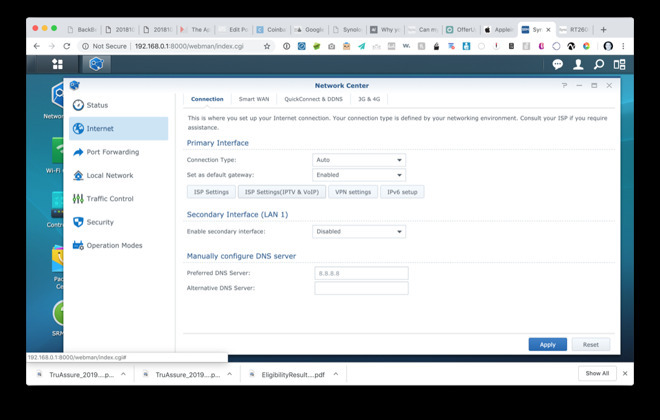 Here, you can configure the wyour Internet connection from your ISP -- your "wide-area network" -- whether that's just DHCP like you'd use with a cable provider, PPPoE like you'd get from some DSL providers, DS-Lite (dual stack, IPv4 packets encapsulated in IPv6), configure your local network, port forwarding, quality of service, security, and operation modes. 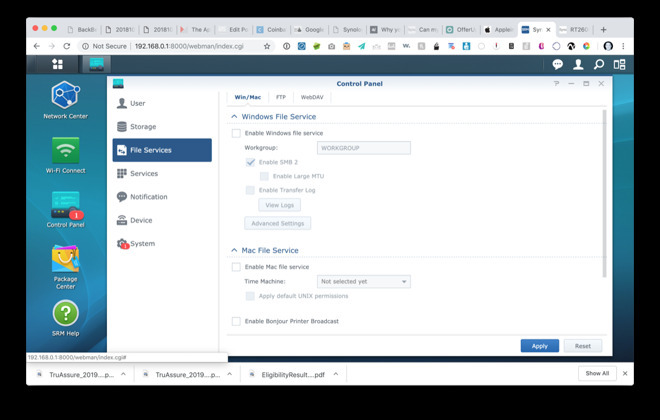 For those of us who miss the Apple Time Capsule, Synology lets you use the connected storage for Time Machine backups by checking a box in the "Control Panel" application under File Services. There's a checkbox for Bonjour Printer Services as well, which will advertise the USB-connected printer to the Mac -- but it lacks AirPrint services. My question is: should I just keep using my Airport Extreme tower, or do this alternatives outweigh the remaining life in my current Airport wireless router? If it's working for you, then there isn't a compelling reason to replace it. However, it is nearly always easier to migrate to something while the old unit is functional, rather than waiting for the old one to crash and burn. Looks so ugly. Disgusting even. Very cool router but not having AirPrint is a let down. But is AirPrint feature really necessary if the printer is already has AirPrint built-in? 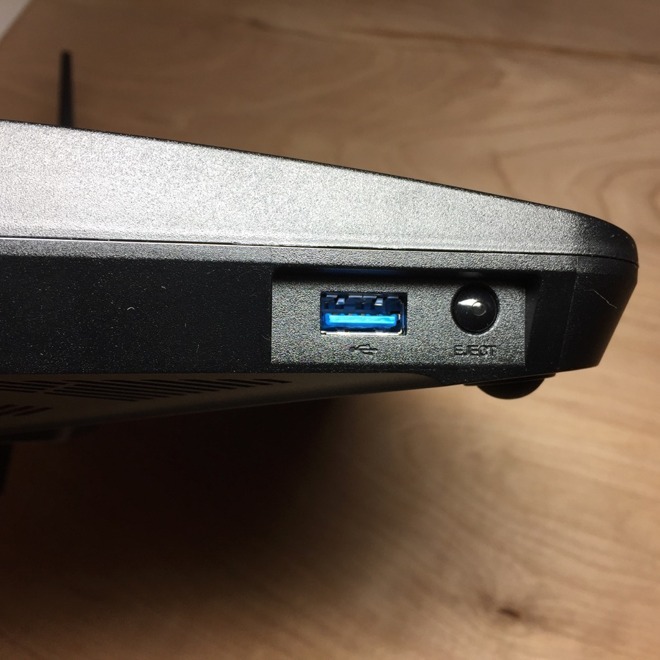 Are there any wireless access units other than the Apple that have the audio port? I use my Airport units to connect various stereos in different rooms so that I can play the same feed throughout the house. The fact that it also helps even out my wireless is definitely nice, but I'm using them mostly for the wireless audio. I use this router in our office and it is excellent. Recently added the mesh router component (MR2200ac) to take care of some areas that were not getting a great wifi signal and it worked well. I use Synology NAS products so the router OS was familiar. I agree with AppleInsider this router is a good Airport replacement. For last 2 years, I am using Netgear Nighthawk(R) X4S R7800 AC2600 4x4 Dual Band Smart WiFi Router, Gigabit Ethernet, MU-MIMO, and that is awesome router. Reviewing routers in a meaningful way that measures throughput performance in various networking scenarios is not for the casual reviewer. You can't approach it the same way you would for the newest iOS game-of-the-minute. Yet that is the approach taken here. In the super competitive field of routers, how do you "review" a newcomer to the market--and award it a perfect score no less--without a single measurement of performance and how that stacks up against the competition? All you've provided is an overview of the software package that accompanies a hardware product, with a generic summary of hardware performance ("rivals mesh systems") that's based on who knows what because you appear to have done none of the throughput performance measurement work that goes into a comprehensive and useful router review. This is one of the most disappointing and useless reviews I've read on AI. In response to the question from Jsh56 above: if the WfFi performance you're getting out of your AE Extreme is not causing you any issues--i.e., sluggish performance and/or weak signal areas--then sticking with your AE Extreme may be fine. Some of that answer will depend on how many devices are on your network and the distance your WfFi signal has to cover. I switched from an AE Extreme Tower w/Time Capsule to a new router back in June and I noticed an immediate and significant difference in throughput speed and the elimination of weak signal areas in my apartment. And I'm continuing to use my Extreme Tower as the storage device for Time Machine backups--I simply shut off the radios on the AE Extreme and connected it via Ethernet to the new router. My iMac and MacBook still back up to it automatically with no problems. Yeah - the Airport and a lot of the other newer routers had a much nicer design so you didn't mind leaving it out on a shelf somewhere. This thing looks more like a Romulan ship that you need to hide away. Maybe you could disguise it as a piece of modern art? How I wish that Tim Cook had not killed the Apple router business unit. 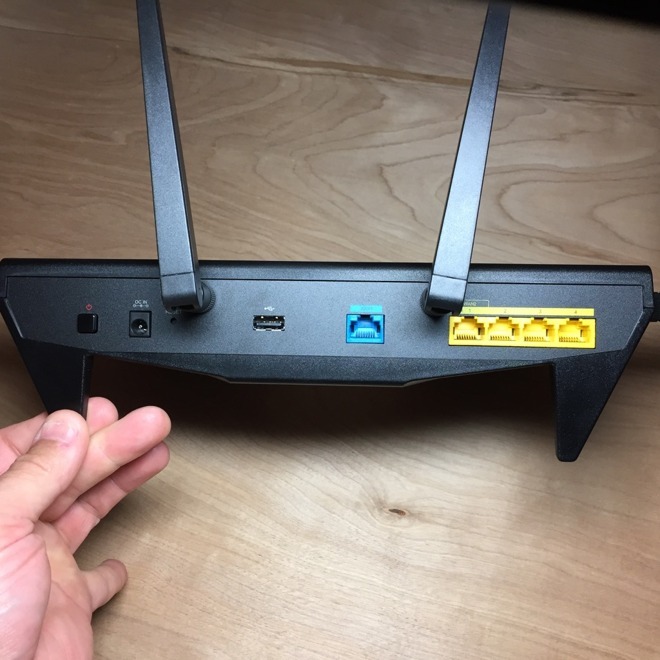 I have had several routers (Linksys, Linksys, Asus, Netgear, etc) that work great out of the box; then about a year later, they start exhibiting what I call "Router Rot". They work, then slow down and require a reset to restore full functionality. This continues to degrade where the router needs to be reset weekly, then every other day, and finally daily. Not sure if this is a sign of thermal, as in the thermal paste has dried out - or degradation of capacitors, or a combination of both. But, when I finally was sick of it, that I listened to my buddy, and paid the extra for an Apple - this annual trip to the electronics store ended. My old 802.11n router works just fantastic, never needs to be reset- it's a frickin' rock. I now use this as an extension to my Air Port Extreme tower, which is 802.11ac. I am lucky enough to be connected to fiber, so my home has 150-250 mbps (I could boost this to 1 Gbps for another $15/month - but at the present speeds - seriously, why bother). If Apple made a router, that supported whatever is beyond 802.11ac - I would be among the first to say "take my money". Thanks for doing the work! And the write-up. It's good to know which device is reccomended. I'll miss Apple's elegant, white design and easy to use software. I guess it's back to the blue/black plastic-y devices found at Best Buy. Ugh! This would definitely be going in the closet! In response to the question from Jsh56 above: if the WfFi performance you're getting out of your AE Extreme is not causing you any issues--i.e., sluggish performance and/or weak signal areas--then sticking with your AE Extreme may be fine. Some of that answer will depend on how many devices are on your network and the distance your WfFi signal has to cover. I switched from an AE Extreme Tower w/Time Capsule to a new router back in June and I noticed an immediate and significant difference is throughput speed and the elimination of weak signal areas in my apartment. And I'm continuing to use my Extreme Tower as the storage device for Time Machine backups--I simply shut off the radios on the AE Extreme and connected it via Ethernet to the new router. My iMac and MacBook still back up to it automatically with no problems. We have a test setup that has a computer on the WAN side and a computer on the LAN side, and we WGET files across them to see how well the router routes. It's mildly annoying to set up and tear down, but we do it. This test setup eliminates variability in ISP or links after the ISP. I apologize for not including a table showing the results of copying files across at speed. We have also done signal strength and dispersion tests in a number of different homes with this router, and have the heatmaps to show for it. As a standalone router, it really does match or outperform some of the mesh systems we have tested in the past. The Amplifi systems, for example, are very directional: the main units tend to have the strongest signal coming off their front faces with the touchscreen LCDs. We do not compare routers to each other in the same review - that is, we name the one unit we're reviewing and don't name others we have reviewed in the past. 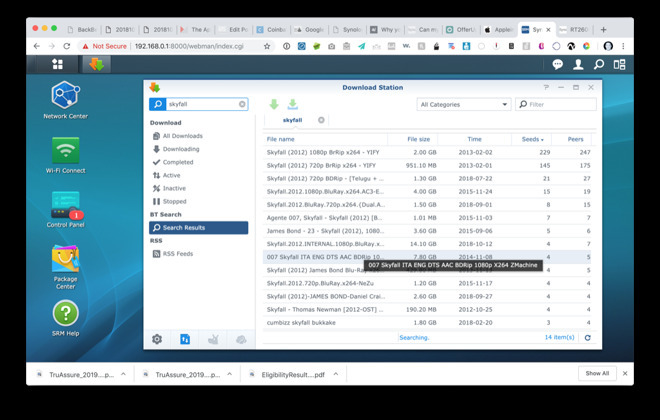 The short summary of those comparisons is, in terms of routing and wifi signal strength and dispersion, Synology is on par with the Zyxel 3000 we reviewed not long ago, and better than either of Amplifi's products we reviewed in the past. 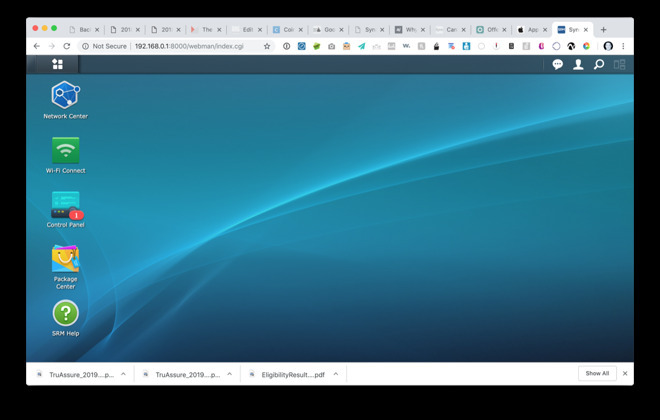 Synology comes out far ahead because they don't cripple the configuration in all the ways that all the others do - performance and options = top score. Amplifi HD and Amplifi Instant Router try to mimic that - but they don't perform as well at speed or wifi signal, and don't do Time Machine. What are you to do, pick something functional, or something that looks nice, when you can't have both? 802.11ad in the 60GHz band is coming. But no iPhone or Mac supports it at this time. You could only use it with a USB adapter at this time. Give it six months to a year, and that should change. But my experience with it so far is limited. What I have heard is that it works very well for line of sight, but walls are problematic. We'll be looking at it in the new year. 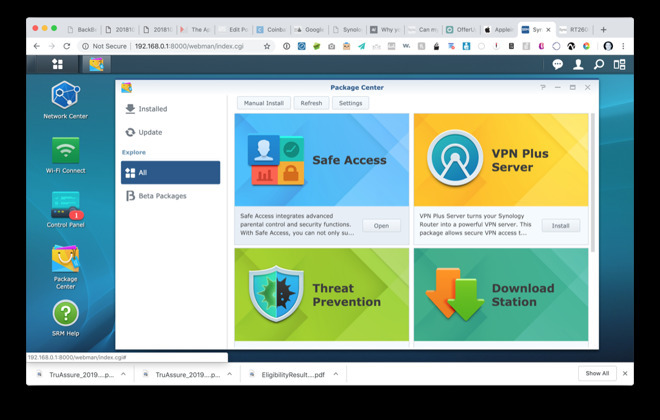 The Synology is one we've had for a year and change. It's relevant because they're introducing their MR mesh router nodes for it. It hasn't suffered router rot (something I saw with a lot of Linksys and SMC I've had over the years. 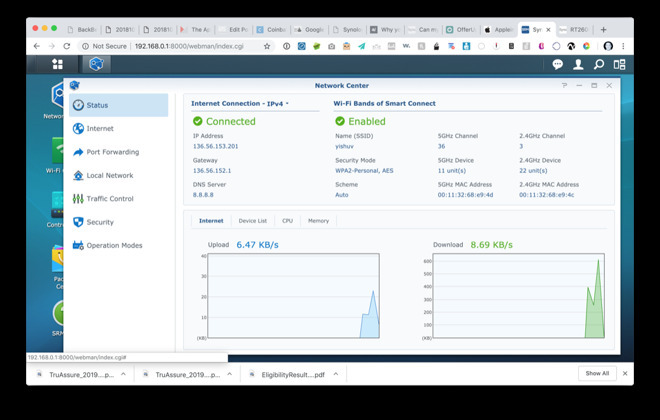 Synology has been a rock, like you say, and this is using it on AT&T 1gbps fiber and Google 1gbps fiber. Bad capacitors were a thing of the early 2000s, mostly. It was a cost-cutting measure to use Chinese capacitors instead of Japanese ones, and manufacturing processes weren't up to snuff for the part substitutions. You'd see them leak out the bottom, or balloon the top up, or both. Your 802.11n AirPort is probably from around 2006, by which time most of the bad caps were gone. Chromecast Audio is one way of doing it, but it's not a first class citizen on iOS - you define speaker groups in Google Home app, and then push all the audio across. Or you could use AppleTV and extract the audio from HDMI with an adapter (or optical on older AppleTV). Other things people are doing is running shairport on raspberry pi. You could do it on any linux computer with a sound card, but Pi is small, which makes it attractive for the purpose. this article explains more. I have looked for a travel router with audio that I could run shairport on, but have yet to find one I can recommend. As SJ once said: "Even our butts look better than their faces!" Yeah, everyone's routers are either alien spiders of antennae, or things that attempt to look nice but don't perform as well. Download CLOAK from the Package Center. It's not, but this print server is for USB printers, not network printers. If your printer already has a network connection (either through WiFi or wired Ethernet), the print server in this router shouldn't matter.